Dana Yeats of The San Mateo Daily Journal reports in the Wednesday 3/19 edition that Foster City hired a private contractor to begin poisoning ground squirrels along the levees. Foster City is home to about 30,000 citizens. It was constructed as a moated, upscale California island bedroom comunity on massive landfill, in San Francisco Bay wetlands, in the 1960’s – about the year Rachel Carson published Silent Spring. Animal lovers protested the city council’s decision to poison the squirrels. Reasons given were to protect the levees from burrowing, and the association of squirrels with the spread of bubonic plague in California. The city claims squirrels burrow faster than workers can fill the holes. If poisoned squirrels should die before making it back to their burrows, the contractors will have to pick up the dead carcasses. There is no provision for private ceremonies. Since 1925, the CDC reports there have been only “sporadic” cases of bubonic plague acquired from wild rodents, including ground squirrels, prairie dogs (Sierra marmots), and chipmunks. Fleas are the actual vector to humans and their pets, as we know. I was unable to find actual “incident” figures for California, but the CDC says the plague vaccine is no longer commercially available in the United States. Dana Yeats of the Daily Journal also reports only a few known cases of plague in the county, ever, and none in Foster City. We used to plant a lot of bulbs when we lived in San Mateo. Like most gardeners, we learned to protect them against Mr. Squirrel. We used chicken wire. We also had racoons. We didn’t try to bait or trap them, either. Little did we know – we actually enjoyed living in an urban environment that could be such a harmonious home to so many different birds and critters. NEVER use poison. You will end up poisoning your dog, cat, wildlife and yourself. If you poison, you will have to poison forever because the animals will adjust their breeding to fill the void of animals. It is physically impossible to poison all animals. Some will always survive. It’s illegal to poison tree squirrels. If you poison a ground squirrel, it will get thirsty and weak, venture out of its hole and your cat or dog will eat it and die. A hawk will also eat it and die. It is illegal to expose the poison to wildlife, pets, anywhere children might be or bodies of water. You must use bait boxes in these situations which is practically all the time. The rotting corpses attract flies which will lay maggots and attract other insects. Rotting corpses in the burrows and in your yard is a ripe breeding ground for deadly diseases. That’s how Anthrax is made naturally, mold spores growing on rotting bodies left in the dirt. If you walk outside you can also get the poison in your system through dermal contact with the dirt or inhalation. The poison has a long half life and you could be sick for a long time. It can kill you. We couldn’t have said it better. Now parents have yet another reason to tell kids not to play on the levees. Back in September 2006, we posted a note called Boy Mechanic Changes A Flat, and CostCo’s excellent service when we replaced the tires all around. This week we found the left front radial had gone almost flat, and so put some air in the tire and made our way to the local CostCo tire center to see what they would do for us. I couldn’t find my receipt for the tires, but CostCo found the original transaction on their computer in about five seconds. My car’s turn for service came just as I had finished shopping inside. The mechanic pulled a nail out of the center of the tread and had it plugged and patched, with me on my way home, in less than half an hour more. No charge. This kind of no-hassle service buys a lot of loyalty in my book. Think about CostCo next time you shop for tires. A “pool vac” is a self-propelled underwater device for cleaning the bottom of swimming pools. The device itself is complicated in its number of parts, but simple in operation. Figuring out how it really works – its care and feeding – has taken me many years. Most of us don’t own pools. We would not be expected to have much curiosity about the hot-climate suburban lore of pool maintenance. In Phoenix we’ve been through three Hayward® brand pool vacs. I’ve struggled throughout the years to understand why sometimes “Hayward”, as we always anthropomorphised the little device, worked superbly – and sometimes didn’t work, or hardly worked, at all. Hayward is just one part of a delicate system. If the pool isn’t healthy, Hayward is going to get sick. In a rare “eureka moment” I saw the answer to my question: trying to “fix” Hayward is only going to buy a few hours or days of smooth operation. A happy Hayward is the result of many things working well together: pool pump pressure, the condition of the skimmer and filters, the amount of unfiltered debris at the bottom of the pool, the pH and condition of the water, the age and condition of 40 feet of umbilical hose, and wear and tear on Hayward’s moving parts. Holy cow, that’s what the doctors have been trying to tell me for years about my own body. Hayward is powered by the water flow in the suction hose, which is fitted on the other end to the pool skimmer. The water flow also carries away dirt and debris collected by the vacuum on the underside of the unit, as Hayward scoots along the pool bottom. 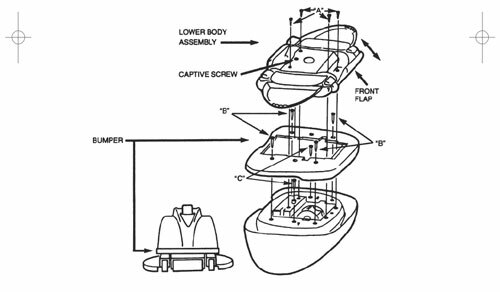 An internal geared water wheel, a simple water turbine, drives the moving parts – visibly, its flapper “wings” and footlike “shoes”. These parts help Hayward to glide just above the pool bottom. The flappers help prevent Hayward’s vacuum suction bottom from clamping onto the bottom by creating a thin boundary layer cushion of water. The little natural rubber feet help Hayward to push off from the bottom, and may assist in forward motion. Channels in the flat bottom plate seem to intake water more from the front of the unit than the rear. The net effect, however engineered, is a modest forward motion of about 6-8 inches per second. The Hayward unit vacuums along the bottom in a random path, and will actually clean more than 70% of our pool in the first hour of operation. It is also programmed to spend about 20% of its cleaning time on the walls of the pool. Hayward’s bumpers are also programmed with a modest obstacle avoidance system: if it gets “stuck” pushing against pool steps, for example, it will eventually muddle itself around and scoot off in a different direction. Pool algae is a killer. If your water “gets away from you” and you get an algae bloom (excessively hard water; pump stopped or clogged), this also coats Hayward’s moving parts. It will stop, slow down, or get “stuck”. Chemicals: Chlorine in moderation keeps pool water clean and algae-free, such as is supplied by the chlorinated “tablets” everybody has seen at hardware stores everywhere. When you “shock” a pool, you are trying to regain control of a water problem, which may involve adding massive doses of liquid chlorine or dry “shock” powder. This is rough on plastic parts. Hayward should be taken out of the pool before a shock treatment, but often isn’t. Pump pressure is everything. Too little pressure, and there is not enough suction to operate or propel Hayward. Our pump’s rating will never deliver too much pressure, but that could cause excessively rapid operation or perhaps its suction would just cause Hayward to clamp to the bottom. When Hayward inexpicably slows down or stops, and cleaning its intakes doesn’t correct the problem, that usually means it’s time to check the pump basket filters, or perhaps even backwash the sand filter. 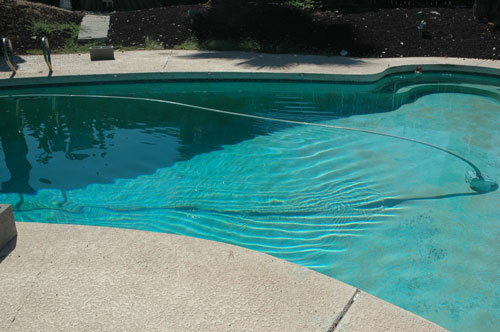 Wear and tear: Below-ground (excavated) pools are generally lined with gunite, a sprayable form of a sandy concrete mix. Some pools are resurfaced with a pebble texture. This causes wear of Hayward’s flappers and feet as it scoots along the bottom. The flappers have stamped wear indicator marks to indicate when they have been abraded down to replacement level. It appears that, in this pool, flapper replacement every year would be a good idea. I was surprised how much effect this has on the spriteliness of Hayward’s forward motion underwater. The flappers look much the same worn as new, which supposedly explains how our 3-year old “backup” Hayward’s flappers had even the indicator marks completely ground off. This spring, everything’s working in synch, like a good little ecosystem. I had the pool drained and refilled last winter, eliminating a hard water problem that caused uncontrollable algae bloom. The pump fittings are in good repair. I backwash periodically. The filters are cleaned regularly. Pool water level is right where it should be. And Hayward is back from a repair and tune-up (free – under warranty) with new shoes and flappers. He scoots merrily along, gobbling up wind-blown stuff as fast as it can get into the pool. Every part of the system is working well to contribute to the success of each other piece. And that’s what was so hard for me to grasp. Oh, sure, if the filter baskets are a little full, or the pool water’s a little low, or I haven’t backwashed in months, Hayward still operates, pretty much, though not well. If all of those things are in dire need of attention, Hayward may work slowly, sporadically, or not at all. But, it’s a system. Grasping that every part of the system is important is easy. Grasping how interconnected and interdependent everything is – that took a little longer. As with human medicine, we can’t just say “we’re going to ignore your blood presure and just reduce the pain in your knee.” To steal the old doctor’s gag, if I’d known I was going to live this long, I would have taken better care of myself. Boy Mechanic got himself a classic case of flat tire on Crow Canyon Road, a remote back-woods over-the-hill shortcut to CostCo in Danville. I just wanted to pick up some coffee beans and honey. I ended up being CostCo’s guest for a couple of hours, did a lot more shopping than I intended, and bought four new Michelins and had them installed and balanced. It all started with a slow leak in the left front tire. But this just meant adding more air every other tank of gas or so. Boy Mechanic knows that even a good tire man won’t find a slow leak in the dip tank when it’s that slow. And who has time to have a tire checked out for a slow leak? The tire cooperated with my diagnostic skepticism by increasing the speed of the leak. After several months, every tank of gas seemed enough, and then even that no longer seemed to be enough. I re-inflated it yesterday to visit some friends in Antioch. I had to re-inflate it this morning to go to CostCo. By that time even Boy Mechanic knew it was time to have the tire checked, and CostCo sells tires. The tire cooperated even more cheerfully by going completely flat out in the middle of nowhere. I pulled off into a safe flat clearing by the roadside. Boy Mechanic, who hasn’t had to change a tire in an honest 25 years, hoped against hope that Toyota put all the required stuff?in the trunk. The salesman said it would all be there, back when we bought the car new in 1999. It was all there — even the special star-shaped lug nut security tool. After 25 years, you begin to wonder if you remember how. I found the jack point on the frame. I remembered to loosen the lug nuts before the tire was jacked completely off the pavement. The little tire iron is no match for the torque of mechanics’ air wrenches. A little tennis-shoe power broke the lug nuts free, and in only half an hour I had the factory original Bridgestone spare on the left front. Lowering the jack again, I discovered the spare only had 20 lbs of pressure left since the factory put it in the trunk in 1999. That little air pump I bought in the 1990’s, the kind that gets 12 volts from the car’s cigarette lighter, finally came in handy after all these years. 35 psi (but it takes forever), and I was on the way to CostCo. At first I just paid to replace the two front tires – you replace them in sets – but I got to wondering: the rears also had about 30,000 on them. They might be good for another year, but when would Boy Mechanic ever find time to replace them? The Divine Creator had just given me that time, whether I liked it or not, so I took advantage of that to pay for two more tires, making a full set of four. I had two hours to kill. I found the honey and the coffee beans. The store was swamped with customers, but who’s in a hurry when the mechanics have given you two hours of shopping time? I also bought a new jacket for Fall, a Philips SonicCare electric toothbrush, a generic Moto-Tool power tool set with 106 bits, new T-shirts, a year’s supply of Saltines, and some of the new, efficient compact fluorescent bulbs that replace regular light bulbs. When else would Boy Mechanic find the free time to buy all these much-needed supplies? I also bought a hot dog and a coke for $1.60. I swear it was the best hot dog I ever ate. The car was ready when promised, but I had plenty of time to reflect: not only do I get to ride around on the safety of new radials, I remembered how to change that flat myself! Good thing, too. Triple-A road service wouldn’t have been a big help here; Boy Mechanic had forgotten and left the cell phone at home. Oh, and would I recommend CostCo for tire sales and service? Absolutely – they are a courteous and professional crew. 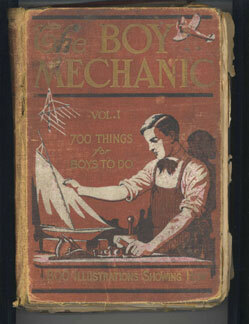 Boy Mechanic does woodworking, too. (Remember, that’s pronounced “Boy MECK-a-nick”). 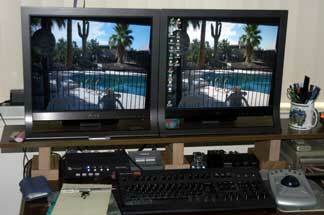 A while back we picked up twin Sony flat panel 19″ monitors, finally giving us two monitors of the same size that output the same color values. 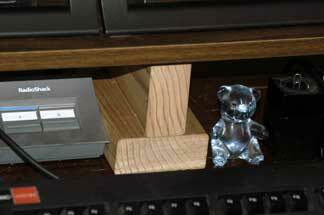 They sit low to the desk, and we realized some kind of a desk hutch was needed to get them up to eye level. A trip to Pete’s Ace Hardware solved the first part of the problem. I found a 4’x8″ veneer shelving unit that did the job. The Pete’s saleperson and I had a good laugh at my only idea on how to prop up the shelf. Bricks would scratch the desk. 4×4’s aren’t high enough for the stuff I want underneath the shelf. I said the only thing I’d thought of so far was coffee cups. Yes, we had a great laugh at that one, but that’s exactly what I used, until I could think of something better. I found I had some scrap 2×4 ends of clear redwood, very nice wood, and enough long pieces for this project. However, I have no saw in the apartment, so that meant a second trip to Pete’s. Honestly, what Boy Mechanic project is ever properly finished with only one trip to the hardware store? I picked up a real miter saw, and a cheap plastic miter box for straight cuts. I grabbed a box of 100 number 12 2-1/2 wood screws (6 each would have done it, but I had to have the whole box). I bought a countersink for the screw heads, and treated myself to a new set of drill bits. It’s a lot of work making the cuts, particularly since that plastic miter box binds a lot until you’ve used it for a few projects. But, an hour later, I had my cut pieces, and pilot holes marked with a cardboard template and drilled out. For assembly, a couple of those big wood screws, tightly screwed home, secures the two pieces for good. So you see, two free scrap pieces of wood, frugally saved, and $65 worth of tools and hardware, made it possible for Boy Mechanic to assemble redwood shelving supports worth a couple of bucks each, at a minimum. I’m confident that not even an earthquake will loosen or topple these shelf supports. A little bit of wood stain would make them look nicer. But, in an apartment, who has wood stain? Sounds like another project for Boy Mechanic! This is the clock Boy Mechanic fixed. Remember, that’s pronounced “Mek-A-Nick”. Hover your mouse over the empty space between the brackets here [ ] and tell me what you hear. Nothing? That’s because Boy Mechanic replaced the clock’s failing, noisy old quartz movement with a new, silent quartz movement. Selecting the right replacement movement is most of the work. We found Klockit, a website and mail order house that specializes in clock parts and kits for hobbyists. You could go bananas there. Looking for parts to build a grandfather clock? A clock with tides and phases of the moon? Klockit’s got it. By measuring the old movement we determined we needed a 2-3/16″ square x 5/8″ case size with a 5/16″ shaft diameter. Hand shaft length was a bit tougher but 5/8″ was the only size we found (it turns out there are others). We ordered the movement with a free pair of hands, choosing the plain black hands in the picture. The sweep second hand is $0.35 extra. The parts arrived, and installation was trickier than we bargained for. The old movement set into a couple of plastic posts on the back side of the clock face, as well as the plastic retaining clips that seem to be standard. The new movement had no holes for those posts, so we drilled the posts out. The new movement does fasten with a brass hex nut on the clock face (underneath the cardboard dial insert printed with the numbers 1-12). As long as the clock doesn’t fall off the wall in an earthquake, the movement is secure enough. The first installation resulted in the second hand binding against the clear plastic face cover, so we re-mounted the movement with a cardboard shim. That gave just enough clearance, and we put everything back together. 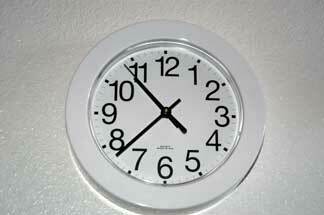 The result is a fixed and totally silent $7.99 Target plastic wall clock, for only $17.79 (including shipping). The sensible thing would have been to just buy a new clock, and we originally did that. An ugly Target $12.99 replica retro Big Ben wall clock turned out to be almost as noisy. We put it in the bathroom, but even there the ticking stopped being cute and retro after about ten minutes. We retired it to the linen closet. Besides, I was partial to the stark, minimalist simplicity of this white clock design, which served us well for a number of years until it inexplicably started developing that really obnoxious “tick”. The newly repaired clock is so silent you can’t hear it at all, and the continuous-sweep second hand is a novelty since the cheap quartz movements took over the wall clock business. All in all, I would have paid more in the first place for a clock with this movement, if I could have located one. When you see an ad for a wall clock, it never mentions whether it’s noisy or not. When I started paying attention to such things, everybody’s clock that I “listened to” had a tick that, in the quiet still of the night, could be considered excessive. Boy Mechanic to the rescue! Boy Mechanic is now a regular “Category” of the My Notes page. Stay tuned for more exciting sagas as Boy Mechanic fixes things! It was pretty neat stuff, but I and my friends made fun of the idea in the 1950’s and 1960’s, as if the only kids who built and fixed things were nerdy social misfits. If we didn’t fix our stuff ourselves, who would? We would taunt each other with the jibe, “Boy Mek-a-Nick“. Boy Mechanic can do other tricks, too. I left our laser printer on for two weeks with the A/C off, and 105 degree heat and the toner just ruined the drum – prints came out so dirty you could hardly read them. I purchased the replacement cartridge at Fry’s today, installed it, and it worked. I bet they don’t tell you about Laserjet cartridges in Popular Mechanics 1925, either! Total cost: $69.95. If you’re interested in the original Boy Mechanic series, just Google it. This is what kids did before iPod Nano, before the internet, and before half the families in America even owned a table radio. Imagine, your own wireless set or aerial glider! I plan to spend some time there for nostalgia’s sake. I may even learn something. Since the works are no longer copyright in the USA, you can even download PDF or plain text renditions of the original Boy Mechanic!